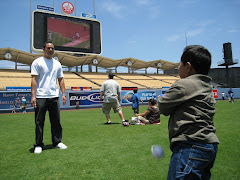 My buddy Alex hosted another autograph signing at his practice in Rowland Heights. He brought in Vince Ferragamo who is one of the nicest former athletes that you will ever meet. Vince took his time to meet all the fans that came to this autograph signing. He couldn't help but sign multiple items for people who waited patiently in line. The turnout was one of the largest that Alex has had at any of his events. Nearly 100 people showed up to meet the former Rams star. A good portion of fans were Alex's patients who had priority in line. Since they spend a lot of money for his services the least he could do is let them go first. I had a lot of fun since I spent plenty of time talking to Vince throughout the event. I'm not sure how much fun other people had, but I had a good time. People in line? 80-100 people. Items per person? Most fans had multiple items signed. Giveaways? Vince Ferragamo photos to a select few. Vince signed 7 items for me. short video of Vince signing for patients who had priority in line. told me he really likes Santana's Black Magic Woman. I'd like to thank Vince Ferragamo and Alex for setting up this free signing at his office. This has nothing to do with the signing but it's something that I need to write about. More than likely this will be the last recap I ever post on this blog. I'm not going to post anymore upcoming appearances either. I am currently working on a new project. I appreciate all those that have visited this site time and time again. Thank you.